RSS readers are immensely useful tools for more than just keeping up with your favorite sites. In the past we have talked about different tools to use your Google reader. Some were about bettering your reading experience with Google Reader. I know I use Google Reader to catch up on my favorite sites. The hard part is making your experience easier. Usually easier means you will use it more. 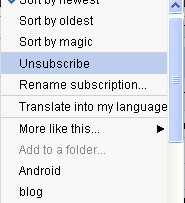 Here are a few ways to make Google Reader easier to use. 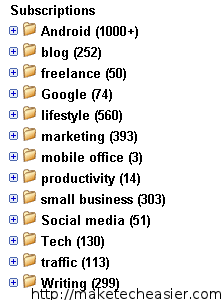 Using folders to sort similar sites together will be the first step in making Google Reader easier to use. Just like in your email, folders help you easily find what you are looking for. By sorting sites into categories that make sense to you, you will be able to pick out posts from sites that are your flavor of the moment. Many blogs simply stop posting new content. If this happens, you can eliminate them from your reader. It is better to bookmark the site as a resource than leave a dead feed in your reader. You may even lose interest in a topic over time. When this happens, there is no need to keep these sites in your reader. They will take up space and make you feel guilty for not having read the 500 recent posts in that folder. 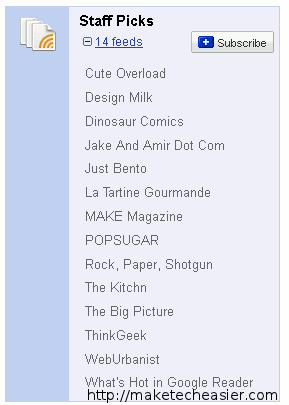 Using tags in Google Reader can make finding a certain articles easier. I have a read later tag for posts that I find the title interesting but can’t read at just that moment. Another good way to use tags is as a sub category. Sometimes you may want to create a folder with an obscure name, but it will not really apply to more than just the one site or article. This is where tagging will come into play. Instead of creating a folder to house one site or interesting post, make a tag for it. The tags show up at the bottom of same list as folders so you wont forget what tags you have used. Another way to keep your favorites easy to find is to star them. Using a star can serve what ever purpose you’d like it to. The star can be used as a read later option or to recall what you started to read and need to finish. People change their interests very quickly these days. Trends will tell you what you have been reading lately so you can possibly eliminate sites or topics you no longer read. Bundles are a bunch of sites that someone likes and wants to share with others. If you own or write for several sites, you could create a bundle for other people to subscribe to your work. Google Reader is like many other web applications. It is made for a specific task, but by using a little imagination, you can make it work the way YOU want it to. Whether that is through browser extensions, the way you organize it or by using third-party applications.There is always a different possible use than originally intended. How can we search for bundles? On the left side of the Google Reader page, near the top. Look for “Browse for stuff”. You can click on either view all featured bundles or view all from Google. You also have the option to see what your friends have created or create your own. I use pretty much all these, except I don’t star anymore cause I star so many things and it would be hard to find if you star like a million posts a day. Can Rolio Be the Next Google Reader Alternative?